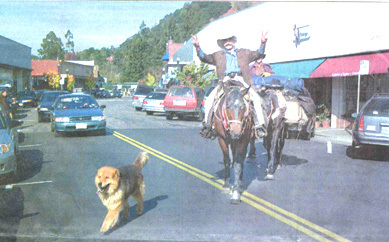 Doc Mishler is an inspired man who has traveled on horseback from Choteau, Montana to the Bread for the Journey offices in Mill Valley, California to raise money for the plight of hungry children. Mishler, his two horses and dog, met hundreds of people along the way, many who housed and fed them during their five-month, four-state trip, which began in June 2002. Mishler said he was inspired to make the trip after hearing Bread for the Journey founder Wayne Muller speak at a Michigan college and reading his book, How Then Shall We Live? Mishler said, "Every day fifty thousand children die of hunger and hunger-related illnesses. This is unacceptable. I ride for them. Perhaps you would like to contribute to the healing of our children by pledging per mile? I will ride 10 miles per day. You can send your contribution to Bread for the Journey at the address below or connect to the Just Give link at the bottom of this page." 100% of the money contributed to Bread for the Journey in honor of Doc Mishler will be given to an organization that feeds the hungry. On Christmas Day Mishler will continue his journey, riding the back roads and trails along the coastal ranges to the Mexican border where he will turn east and head for Texas.